On January 11, 2013, as a group of snorkelers and divers were enjoying a Manta Ray Night Dive off the Kona Coast of the Big Island of Hawaii, a wild dolphin began slowly circling in, as if seeking something. The dolphin finally came close enough to diver Keller Laros for Laros to see that the dolphin was tangled in fishing line and a hook was imbedded in his or her flesh. Laros reached out to touch the dolphin — something wild dolphins never allow — and this dolphin not only allowed the touch but cooperated with Laros, remaining largely still in the water as Laros went to work removing the line. It wasn’t easy. It took a lot of maneuvering the dolphin’s pec fin and probing and picking at the dolphin’s sensitive skin. And yet the dolphin tolerated it, even letting Laros go to work with a blade to remove the line, swimming off only once to surface and breathe. 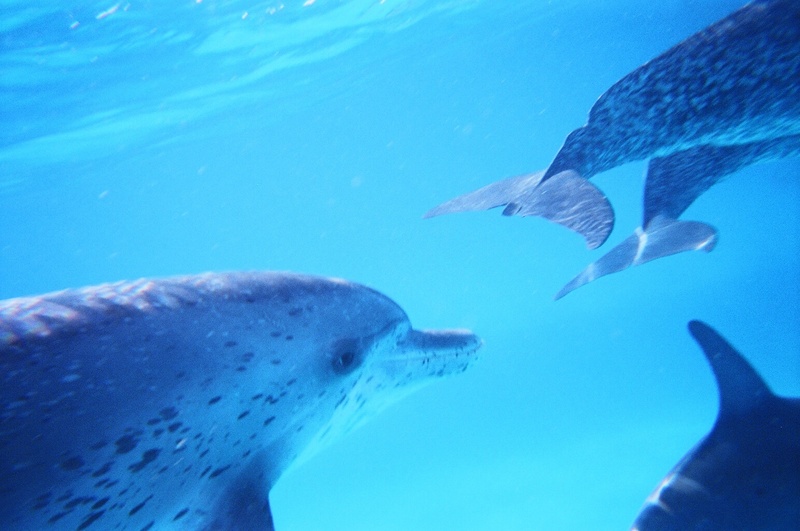 Martina S. Wing, of Ocean Wings Hawaii, was able to record this marvelous moment of wordless communication and cooperation between human and dolphin: two big-brained, intelligent, sensitive, self-aware, air-breathing mammals — so different, and so alike. Wing was initially told that Laros and co-divers Masa and Jason Keeffer couldn’t get all the line and hook off the dolphin (see video captions), but she later learned and now shares the good news that they did. Questions to ponder: What motivated this dolphin to approach humans for help? How did he or she know to trust them? Thank you to Martina S. Wing for sharing this video. And thank you to Craig Murray and Phil Bruno for bringing it to GNN‘s attention. This entry was posted in Dolphins & Whales, Heroes & Heroines, Rare Encounters, Uncategorized and tagged Big Island, Dolphin, fishing hook, Fishing line, Hawaii, Keller Laros, Kona Coast, Manta Ray Night Dive, Martina S. Wing, Ocean Wings Hawaii, scuba diver helps dolphin. Bookmark the permalink.